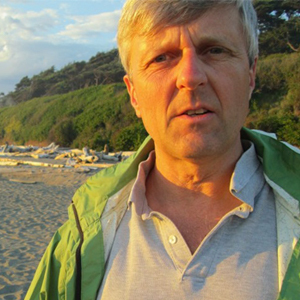 Andrew Newell, also known as RockMagnetist on Wikipedia, is the Visiting Scholar at the Deep Carbon Observatory for 2017-2018. That means he has institutional access to academic sources to improve Wikipedia’s coverage of topics relevant to deep carbon science. He is a long-time contributor and administrator; if you’ve read about geophysics-related subjects on Wikipedia, there’s a very good chance you could find his username somewhere in the articles’ edit histories. Here, he reflects on the experience. This year, I became the first Visiting Scholar to be paid an honorarium. It wasn’t all that much ($3000 over a year), but it did raise questions about conflict of interest. Wikipedia was built out of the voluntary contributions of thousands of editors, and paid editing is rightly viewed with deep suspicion. Wikipedia has a “policy with legal implications” on disclosure of paid contributions and a conflict of interest behavioral guideline. The latter says that conflict-of-interest editing is “strongly discouraged”. Image: File:Gebreide aap techniek rondbreien.JPG, Ellywa, CC BY-SA 4.0, via Wikimedia Commons. My honorarium was paid by the Deep Carbon Observatory (DCO). We had to decide how I should conduct myself so that there wouldn’t be any problems. Under the user name RockMagnetist, I have been an editor on Wikipedia since 2010 and an administrator since 2013. Naturally, using administrative privileges for paid work is a major no-no! So the first thing I did was to create a separate non-admin account, RockMagnetist (DCO visiting scholar). This also made it easy to track my contributions using Wiki Education’s Dashboard. But even this step must be done carefully because alternate accounts are often used to deceive other editors and make trouble. 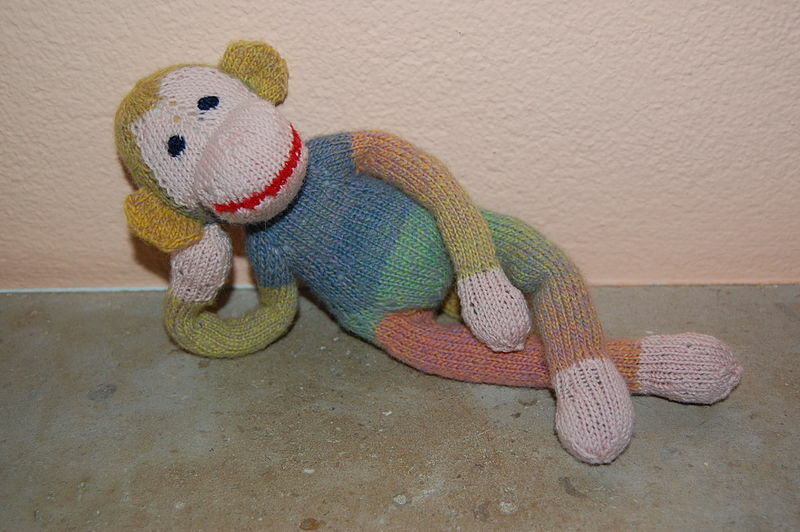 Such accounts are called sock puppets and are among the most reviled objects on Wikipedia. To avoid any suspicion of my being a sock puppet, I made the connection clear in my user name and with a tag on my user page. To avoid conflict of interest, I needed to have a clear understanding with the DCO. Fortunately, they agreed that I shouldn’t actively promote their work. Instead, I would add content in subject areas related to deep carbon, and while I would include work by DCO scientists, I wouldn’t give it undue weight. Readers may wonder if editing articles for the DCO while not giving undue weight to DCO scholars is like Douglas Hofstadter‘s cure for hiccups in Gödel, Escher, Bach: “Run around the house three times without thinking of the word ‘wolf’.” But really, it’s not that hard. The key is to rely primarily on secondary sources, as Wikipedia policy requires. These are published sources that discuss original research, providing context and interpretation. All analysis, evaluation and interpretation should come from secondary sources. And these sources determine the proper weight to assign to contributions by DCO scholars. My initial plan was to use a top-down approach, adding material to frequently visited articles such as Diamond and Carbon cycle, and working downwards from there. This benefits the most people; while Diamond is visited a million times a year, Deep Carbon Observatory only gets about two thousand views. An article on one of the broader topics can also interest readers in more specialized topics. Indeed, I was often inspired to write about those specialized topics. Artist’s conception of a multitude of tiny diamonds next to a hot star. Image: File:SpaceNanoDiamonds.jpg, public domain, via Wikimedia Commons. My work on the article on diamonds was comparatively straightforward. It was already a featured article, the highest level of quality, but the section on the geology was out of date and missing some basic information on how diamonds form. I needed to tear it apart and reorganize it, but if I did that in situ it would leave a mess – something one wouldn’t want to see in an FA-class article, even temporarily. So I rewrote the section in my user space and replaced the existing one in a single edit. The old version had a link to an article called “Diamonds on Jupiter and Saturn”. This was a rambling account of a theory that predicted that it rains diamonds in the atmospheres of those planets. This intriguing theory never gained any traction in the scientific world, but there is a much stronger case for diamond rain on Uranus and Neptune. 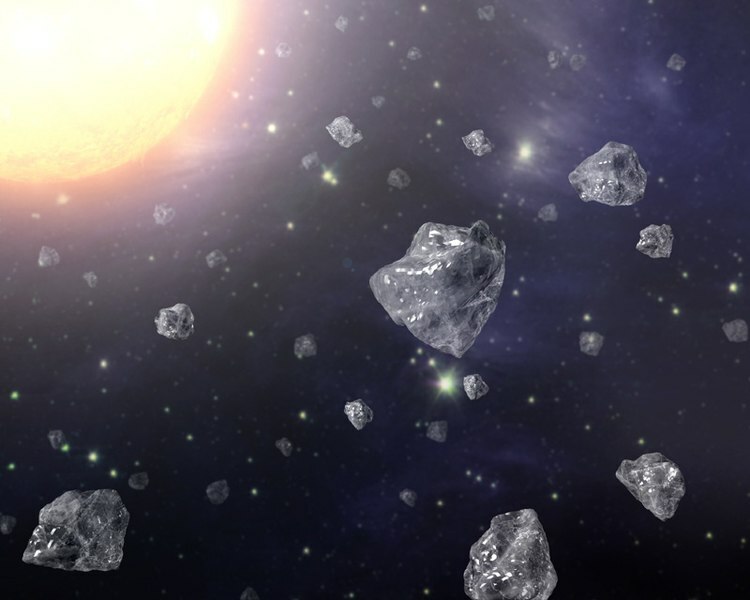 This was the start of a fascinating journey into accounts of a vast number of nanodiamonds forming in space, as well as diamond planets, diamonds forming in stars and a theory that diamond might have been the first mineral in the Universe. This became the article Extraterrestrial diamonds, which appeared on Wikipedia’s Main Page in the Did you know column and attracted over 10,000 views in a few hours. 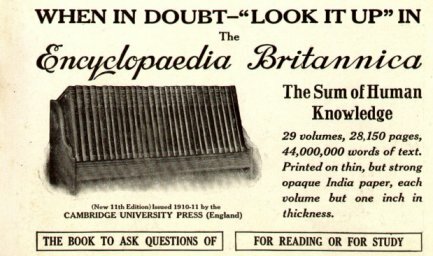 An ad for the 1911 Encyclopedia Britannica. Image: File:EncycBrit1913.jpg, public domain, via Wikimedia Commons. My goal for the article on the carbon cycle was to expand and update the skimpy section on the Earth’s interior. However, a discussion of the carbon cycle, or any biogeochemical cycle, requires a variety of geochemical concepts such as reservoirs and residence times. These are basic ideas in geochemistry, and I felt it was important that they be explained properly somewhere in Wikipedia. This led me to the article Geochemistry. When I first encountered Geochemistry back in 2012, it was a bit out of date – most of it was taken from a 1911 edition of Encyclopedia Britannica! By 2017, sections on the history of geochemistry and trace metals in the oceans had been added, but it was still dominated by a 1911 account of the composition of Earth’s crust. That bothered me. I don’t really know much about geochemistry, but I have often encountered it in my work as a geophysicist, and I appreciate its importance. So I started to update the article. I added a lot of material on the abundance of the elements on scales from the Universe down to the Earth. I also added some basic concepts like differentiation and mixing. After looking at Carbon cycle, I returned to Geochemistry and added information on reservoirs and residence times. I put in some basic information on so-called box models that represent a geophysical system by reservoirs with inputs and outputs. I also discovered that there was already an article on residence time – in fact there were several! The concept is important not only in earth science but also in several engineering fields (it was first developed to analyze chemical reactors). I merged five articles that covered the same ground and developed a coherent introduction to the subject with applications in fields like groundwater flow and pharmacology. I also worked on Fugacity, another important concept in geochemistry and one that I had never understood. After reading the existing article, I still didn’t understand it, so I wrote a version that I did understand. 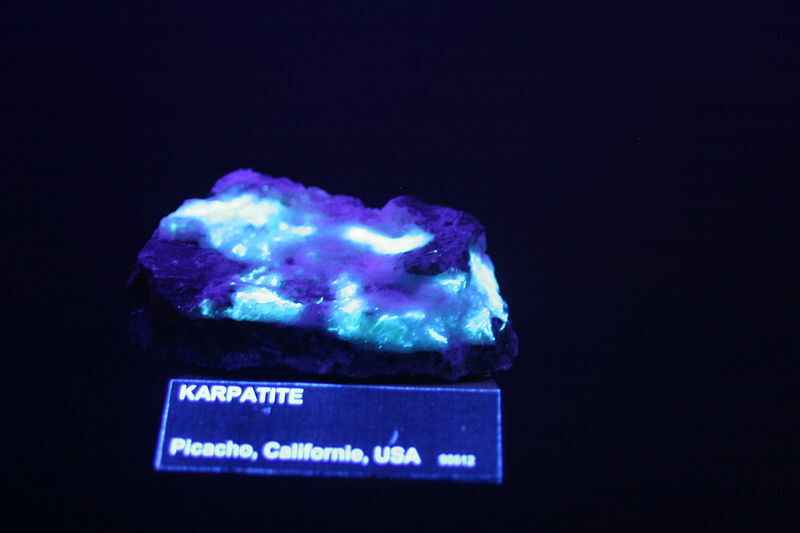 Carpathite, an organic mineral that fluoresces under ultraviolet light. Image: File:Pierre-img 0579.jpg, Rama, CC BY-SA 2.0 FR, via Wikimedia Commons. I didn’t always use the top-down approach. I was aware of efforts by DCO scholars to add to Wikipedia and couldn’t resist looking over their shoulders. They added new articles on some recently discovered minerals such as middlebackite. They were mostly organic minerals, a group of minerals containing carbon. I noticed that this group had no article devoted to it. Organic minerals are generally rare; they are found in curious settings such as fossilized guano; their very definition involves some historical quirks related to early ideas about vitalism; and the DCO launched a Carbon Mineral Challenge to promote the discovery of more of them. So with a bottom-up approach, I created the article Organic mineral, and it was accepted for the Did you know column. Other DCO scholars added biographies of colleagues. Creating autobiographical articles is strongly discouraged because it is difficult to write neutrally and objectively about yourself. The same goes for people with whom you have a close connection. I had intended to avoid biographies of DCO scholars, but I did end up working on two – those of Mark S. Ghiorso and Robert Hazen. Aside from passing Ghiorso in the hallway when I was a graduate student, I have no connection with these people, and objectively they make excellent subjects for biographies, with plenty of independent sources. The joys and challenges of writing scientific biographies could easily fill another blog. Conflict of interest is primarily a quality issue. As the guidelines state, people with conflicts of interest add material that is “typically unsourced or poorly sourced and often violates the neutral point of view policy by being promotional and omitting negative information.” The best way to avoid this trap is to only write about a subject when you can find good secondary sources. And have fun – write about stuff that piques your interest! 1. Hofstadter, Douglas R. (1979). Gödel, Escher, Bach : an eternal golden braid. Basic Books. p. 254. ISBN 0394745027. To read more about RockMagnetist’s work, checkout our roundup here. To learn more about current Visiting Scholars, click here.